A month ago I was given the opportunity to review an Adar scrub top from Uniformed Scrubs. I wear scrubs every day at work and to be quite honest, you can never have enough, so I was up for the challenge. The top that I was sent was the Adar Mock wrap top. The material on this top is pretty stiff. Even after I washed it. I'm usually a small in most items and this was also a little big. So definitely get a size down if you order. I also felt that this top was very boxy, especially around the shoulder areas. I prefer a more giving material with elastic in the fabric, however I do think that this top could stand years of wear and washing! The fabric is very durable. The bunching in the back with the tie is cute and it pulls the top in so that it's not so square. There are a ton of different styles and prints to chose from. You can find more information about their specials and products on their blog , Pinterest, and Facebook. And they have also given me a coupon code for any blogger who is interested in purchasing scrubs! Enter code "trueblue" to get 15% off of your order. It's good until July 31st 2013. 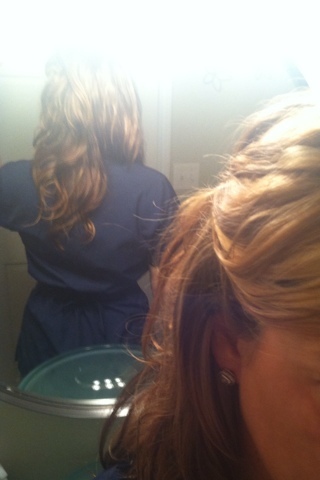 I sometimes wish that I could wear scrubs to work! 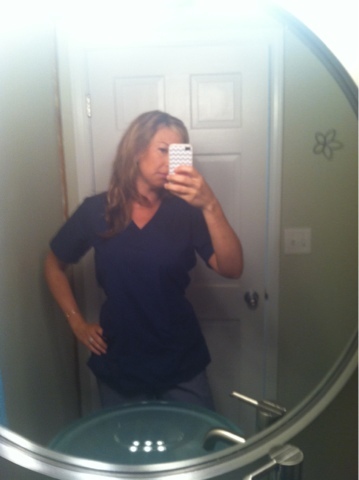 i should have chosen a career based on getting to wear scrubs everyday...sooo comfy!! Thanks for this nice and Helpful post. There is something moderately nice about the "Adar Scrub Top Review ". I like the suggestion. I want to share some information about it. Thanks for sharing this information on review of scrubs. Couple of months ago, I bought comfort scrubs for my daily work. Good to get such excellent quality scrubs at quite amazing prices. Have been using these since then and I am so happy with my purchase.